"The Military Clairvoyant 料敌机先 (liào dí jī xiān)"
There are those who analyze volumes of data before they can predict the future, and then there are those talents who only need to follow their gut instinct. Zhang He was one of those talents, and his predictions were sometimes more accurate than the scholarly military advisers. Widely regarded as one of the five most elite generals in the Wei Kingdom 魏国, Zhang He stood shoulder to shoulder with the likes of Zhang Liao 张辽 and Xu Huang 徐晃 just to name three. But some say Zhang He was the most outstanding amongst all five elites. His military career spanned a staggering 47 years and his military predictions outdid even the infamous Sima Yi 司马懿. You can discard an on-hand card to skip one of your phases (except your beginning phase and your end phase). If you skip your drawing phase, you acquire an on-hand card from each of a maximum of two players. If you skip your action phase, you can relocate a card from any player's equipment area/pending area to a corresponding area of another player. Minor changes in the description for "relocating cards" in his ability. It used to say relocate to a "reasonable area", and it now says "corresponding area". This ability seems to relate strongly to the word "Flexibility" instead of how it applies to Zhang He. The phrase “巧变” comes from the description “张郃以巧变为称 (Zhang He was famed for his flexibility)”, and suits the historical Zhang He in two ways. 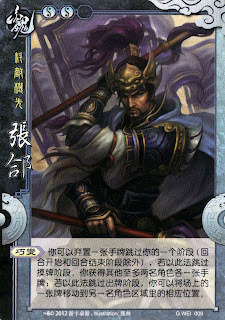 Firstly, Zhang He was able to predict his enemies’ moves, and use various tactics to defeat them. Secondly, he served multiple warlords before he joined the Wei forces, so he was “flexible” in terms of allegiance. Yet it seems that neither these are very congruent to the ability in this character card. No matter. We're still glad that his abilities make him a huge asset to any team! Yes. He still uses one card to activate it though.